We make every effort to provide all of our patrons with an enjoyable experience. All performances and facilities are accessible. For additional information about accessibility at Ravinia or if you have questions, need assistance, or an accommodation not mentioned below, please contact the Accessibility Coordinator at access@ravinia.org. Assistive listening devices (ALDs) amplify and clarify sound by cutting down or eliminating ambient noise. Infrared assistive listening systems are installed in all theaters and headsets may be used at any seat. Due to the sound delays inherent in broadcast sound, these devices do not work on the lawn. Headsets are distributed free-of-charge on a first-come, first-served basis from the main box office at the west entrance to the park. While there is no charge for this service, an ID or major credit card is required as a deposit. Designated accessible parking for vehicles bearing valid Department of Motor Vehicles (DMV) disability parking placards or license plates is available on a first-come, first-served basis. Accessible parking is located on the right-of-way south of the Tyler Gate (west gate) off of St. Johns Avenue. Accessible parking is also available in our west lot, which is located off of Green Bay Road. Parking is limited, so please plan to arrive early on sold-out nights. Parking in these lots is free for Martin Theatre and dance performances and Kids Concerts. For classical concerts in the Pavilion, parking is $10. For all other Pavilion performances, parking is $25. There is always a free and accessible parking option with our Park and Ride shuttle service. The distance from the west parking lot to the Pavilion is approximately 0.15 miles. Ravinia offers a free parking option for all patrons. Accessible Park and Ride shuttles are Pace buses and are equipped with wheelchair lifts. They run on all evenings where there is a parking fee in the main lot. Shuttles do not run for Martin Theatre, dance, Bennett Gordon Hall, or Kids Concert performances. Park and Ride lots are located just a short ride from park. Shuttles drop off patrons at either the north or south entrances to the park. This service begins running a half hour before the published park opening time and runs continuously throughout the performance. The Union Pacific North Line out of Ogilvie Transportation Center drops off patrons at the west entrance to the park. The Metra train cars and Metra platforms are accessible. The Pavilion, Martin Theatre, and Bennett Gordon Hall all have wheelchair and scooter accessible locations where patrons can remain in their wheelchairs or transfer to seats. Patrons who cannot or do not wish to transfer from their wheelchairs to a theater seat should request wheelchair- and scooter-accessible locations when ordering tickets. Wheelchair accessible seating may be purchased by phone, in person, and online. For personal assistance selecting accessible seats or for more information about accessibility for a person with a disability, please contact the Accessibility Coordinator at access@ravinia.org. The park has paved accessible paths throughout. The lawn may be accessed from any of these paths and is accessible. There are many restrooms throughout the park and all are accessible. To view a map of these locations, please click here. 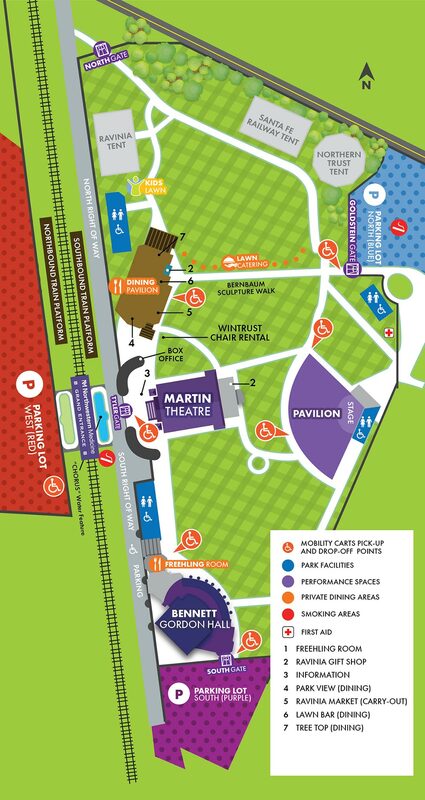 For patrons with mobility disabilities, Ravinia offers assistance to navigate through our underpass connecting the West parking lot to our Tyler gate for all performances in the Martin Theatre and Pavilion. At these performances, RNAs will be available at the entrance to the underpass to assist in pushing wheelchairs through the underpass and will also have wheelchairs available to assist people who have mobility disabilities but do not have a wheelchair. Ravinia does not have wheelchairs available for rent. For classical performances in the Pavilion and Martin Theatre performances, motorized mobility carts will be available inside the park for patrons with mobility disabilities. These motorized carts will pick up and drop off patrons from designated locations throughout the park. They are unable to take patrons to and from the parking lots. Carts will run beginning at the park opening time through the end of the performance. Some exclusions apply. Please contact the box office to check a specific date.